Two of 7s Rugby Legend Waisale Serevi’s children are set to showcase their rugby talents right here in the Coral Coast 7s which starts tomorrow. 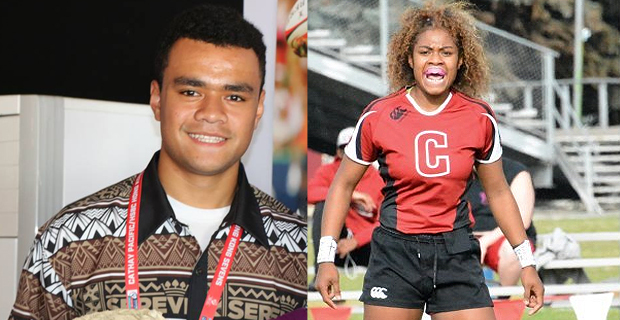 Waisale Serevi Jr will be playing for the USA-based team, King Select 7s, which is competing in the Youth Competition while his sister Asinate Serevi is all geared to display her skills in the Women’s Competition playing for USA based team Scion. The two who are in the country are excited to be following in their father’s footsteps and to be playing at home. Serevi Jr during a training session at Albert Park yesterday showed great passing and foot-work skills, something fans can look forward to. The proud son of the King of 7s is aiming to prove his worth on the field of Rugby and hopes for a good result in this year’s tournament. The Coral Coast 7s will be held from tomorrow to Saturday with the Men’s competition to be held on Friday and Saturday while the Women’s competition will be held on Thursday and Friday. The Youth competition will be held tomorrow and Thursday. You can catch the live commentaries of the Cup quarters, semis and final on Saturday on Viti FM.